EXPLORE — INSPIRE — ACT: Our mission is to save our planet! For more than 18 years, Dario & Sabine Schwörer, their family and volunteers have circumnavigated our blue planet to every climate zone, witnessing examples of climate change and its effect on communities, conducting field-based research for universities, scientists and research organizations, and sharing examples of innovative solutions they have learned along the way to protect, preserve and conserve our planet. At the core of their expedition, they meet with students at schools and community groups, organize clean-up campaigns, and present examples from around the world of counteracting global climate change by living in an environmentally sustainable manner. Their recent project was to support collecting climate samples in East Greenland for the “EAGRE 18” research program and combine it with their activism and engagement in Inuit communities. In this report, Dario and Sabine elaborate about their expedition, its goals, annual highlights for 2018, as well as their strategy, route, outlook and how you can support them in their amazing challenge to save the planet. In 2018 we visited many schools and all universities in Iceland with our program, before crossing part of the Arctic Ocean from Northern Iceland to East Greenland and further from Greenland back to Iceland, and to the Faroe Islands into the Norwegian Sea, where we entered the North Sea sailing between the Shetland and Orkney Islands. The North Sea weather forced us to stay on the British coast. We had quite a challenge crossing the North Sea to Amsterdam, needing to avoid all the oilrigs and shallow spots that steep seas. In the Netherlands we sailed from Amsterdam on the North Sea Canal into the Ijsselmeer to Medemblik, where we winterized Pachamama. There we re-assembled our bicycles thanks to our founding member Peter Storm. We cycled all the way up the Rhein River through 6 countries visiting schools along the way. We have just arrived at the source of the Rhein River and will visit more schools in the next months. The TOPtoTOP Global Climate Expedition and Northeast Greenland Caves Project have teamed up for an adventure-based climate-research expedition to EAst GREenland (= EAGRE 2018). In the summer of 2018, after a long repair and preparation period, the aim of EAGRE 2018 was to explore the region for its caves, map and document our findings, and collect geological samples for climate-change research. Along the way, we engaged with Inuit communities on issues of climate change, did clean ups and inspired them to take up outdoor sports. By sailing, we were able to reduce our carbon footprint. This year, we also continued the systematic recording of whales. For the IPRC, we continued to gather statistics concerning Maritime Debris (pollution) as well as wildlife and climate data. The media coverage was, as usual, very high: see https://toptotop.org/about/press/ . Everywhere we travelled the media were interested in an interview. In all destinations, TV, radio and print media reported very positively about the TOPtoTOP actions. Our belief ‘to go together is to go far’ is a success: The family members and volunteers have gone far again this year and managed to repair the damaged expedition boat and still continue their mission. Difficult pack-ice conditions in August caused some challenges in East Greenland during the EAGRE expedition to get to caves at the Wegener Halvø peninsula about 70 degrees North and later to circumnavigate of Milne Land. To be successful in Scoresby Sund, a mix of being patient and acting fast as soon as a lead opened was required. We wish to adopt this strategy more and more in our activism. Thanks to the International Arctic Science Committee we have collaborated with even more researchers interested in collecting data on our expedition to get a better understanding of what is happening with Pachamama. The idea is also to connect locals we meet in our actions with joining researchers to open new opportunities for both. Our strategy to reach out more to get the media involved worked very well. This approach also helped us to get in contact with the school authorities to organize events and actions. We received activity feedback from TOPtoTOP members in 22 countries. Our ongoing story and challenge is the backbone which creates the unique global family of activists. Our global network is also based on our understanding and solidarity to solve the global challenge we face with climate change. This year the expedition travelled through various parts of Iceland, Greenland, Faroe Islands, Britain, The Netherlands, Germany, France, Switzerland, Austria and Lichtenstein. Our aim was again to inspire young people with good examples of developing a sustainable relationship with nature. In 2018, we sailed the Arctic Ocean, the Norwegian Sea, the North Sea, the North Sea Canal and the Ijsselmeer and cycled all along the Rhein River up to the Swiss Alps and climbed to the mountain tops surrounding the Toma Lake, the source of the Rhein. For details please check our expedition blog on: https://toptotop.org/ . Next spring, we will continue to teach Inuit students mountaineering skills, so that they have another source of income. We aim to inspire another 100,000 students over the coming years with our mission and act to clean up our wonderful planet, circumnavigating the Arctic and the Americas from POLE to POLE in a figure of 8, making optimal use of the winds and currents. Our goal is to build a global student network to solve global challenges, based on understanding, friendship and solidarity. We will focus on giving remote places a voice in their challenge against climate change. We will continue studying the changing migration patterns of whales between the tropics and the poles caused by the warming oceans. We aim to start a revolution in the sailing world in the use of electric motors. It is time to save our planet! Our goal is to establish a lasting movementthat inspires youth to act — even in 100 years’ time from now. Please consider an annual donation, see https://toptotop.org/donate/ . The annualTOPtoTOP-membership is 50 USD/Euro/CHF per household/institution. A lifelong membership is 250 USD, pleaseregister at https://toptotop.org/donate/toptotop-membership/ . Without the generosity and hospitality of the people we meet on our journey, and without your support, our efforts would have been unthinkable. 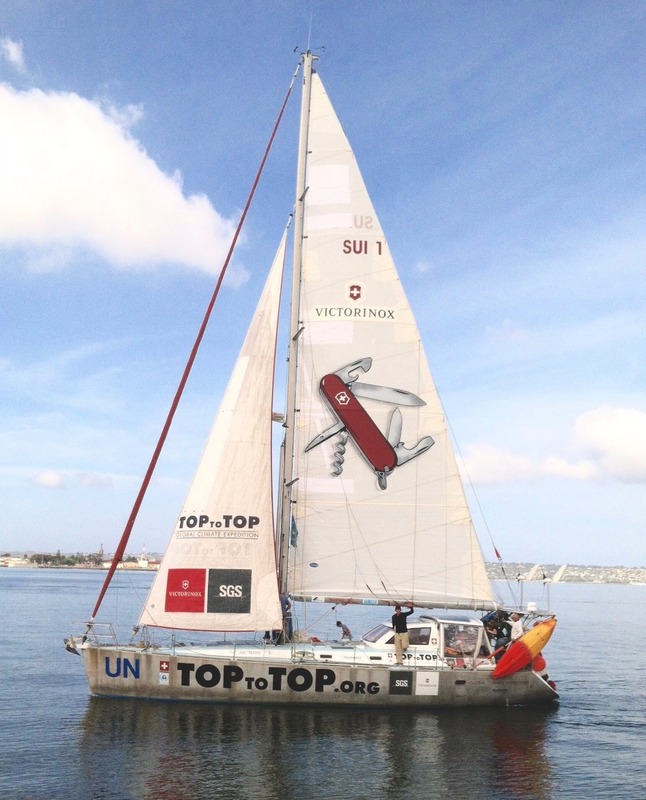 A big thank you also to our partners UNEP and myclimate, and to our main sponsor Victorinox. Our thanks also go to all the benefactors and all those who support our project with their TOP products and services, specially PredictWind, Patagonia, Geberit, WEYTEC, Hostpoint, Colltex, Stöckli, Fritschi, Catch and Lift, Sunware, Webasto, Echopilot, Elco, Optrel, BSI, Ronstan, Pizol, Sika and EBP. Special thanks to our members Mirjam, Meret, Livia, Jana, Christina, Laura, Armanda, Mael, Luana, Marlis, Ladina, Ottavia, Rosi, Gina, Robbie, Chris, Jürg, Sverrir, Marius, Brigitte, Peter, Tessa, Elisabeth, Dieter, Sopie, Tabea and Till who accompanied the expedition. A special thanks Gabi Bolliger, Hanna Law, Bart Ziegler, Peter Storm, Cindy & Kevan & Collin Keegan, Annemarie Büchler, Rosi & Ernst Ammann, Ottavia & Reto Schworer, who have worked like little dwarfs taking care of administration, logistics, website, translations and bookkeeping.